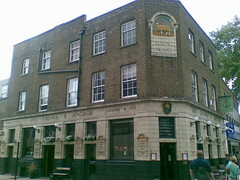 A bar/gastropub in an old pub on Chiswick High Road. It was called Shackology at one point but had reverted to its original name by 2008. The exterior tiling is listed. Previously owned by Convivial London Pubs, according to the Dec 2013/Jan 2014 London Drinker magazine it was taken over by Mitchells & Butlers in late 2013 and now forms part of their Castle sub-brand. bob visited on a Wednesday lunchtime in August 2008. There were several other customers. I had the pan fried schnitzel with tomato noodles and chilli cucumber (£9) photo. The schnitzel was very good, the noodles were okay, though the chilli cucumber lacked chilli (of course there may not have been enough for me to notice). A pint of lemonade and lime was £3.50. Lemonade came from a 1L bottle instead of post mix. Young's ordinary was available on handpump. Last visited by bob, 13 August 2008. Opening hours taken from the Crown & Anchor website, December 2013. Last edited 2013-12-12 12:20:37 (version 10; diff). List all versions. Page last edited 2013-12-12 12:20:37 (version 10).